How might we create a more flavorful and convenient infusion experience? Before diving deep into the research, the following four themes were developed as an initial hypothesis of what motivates consumers into trying and continuing to infuse their water with fruit and herbs. Consumers will continue to place a higher priority on convenience over any perceived infusion benefits because of hectic lifestyles. The amount of prep time, infusion time, and effort required to create infused beverages might drive their association as a special occasion or seasonal drink. Depending on the recipe base, infusions can become a vitamin rich, low calorie, low sugar, alternative to plain water, juices, and sodas. Infused beverages act as a solid stepping stone for many health and wellness goals. Infusion provides the opportunity to play with pure flavor combinations and that experimentation appeals to both novice and expert palettes. Its a method that can cross multiple cultural and culinary categories (ex. drinking vinegars, agua fresca cocktails, punches, coolers). The process of steeping has a strong initial visual appeal that fades as the organic matter begins to breakdown. The visibility of the product also acts a centerpiece of conversation and possibly social prestige. To provide context and drive more innovative brainstorming sessions, I planned for the team to get a behind-the-scenes tour of the Aviary. This cocktail lounge is owned by the renowned molecular gastronomist Grant Achatz, who is famous for finding creative, experimental ways of infusing flavors into unexpected combinations. We were given a tour of the back kitchens by the ice chef on staff, so presentation and attention to detail was the overriding theme. The next day, the team debriefed and brainstormed on what insights we could use from the immersive experience at The Aviary. We came away with three key infusion methods that could be leveraged as design opportunity spaces. The vacuum coffee maker method of infusion at the Aviary led to more secondary research and it turns out a whipping siphon can infuse instantly utilizing similiar physics principles and cavitation. The Mixologists at the Aviary utilized tinctures to concentrate fruit flavors and liquid nitrogen to create powderized herbs. Smooth liquids were achieve by using tami sifters. Coffee brewing methods were used at the Aviary because heat infuses instantly whereas cold temperatures take longer to infuse. Visual presentation largely depends on different ice making methods. After experiencing a professional kitchen, we discovered through secondary research what pro-sumers were doing at home to try and get similar bursts of flavor. Then I tried out each method to better empathize with the average consumer's struggles with infusing water at home and to find out what method was the most effective at extracting flavor. This exercise also provided the opportunity to create a quick taste test around the office and get a read on how much flavor most people preferred in their infused water. 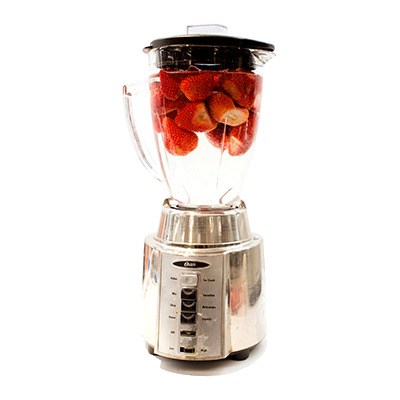 In a mortar and pestle, the strawberries were lightly crushed then tossed into a pitcher with ice. The pitcher was left in the refrigerator for five hours before serving. Both Martha Stewart Living and the brand Takeya recommended using hot water. The heat pulls out the flavor instantly and then ice is added to flash chill the mixture. The fruit was blended with water and then strained twice to eliminate the pulp. The method is a variation on an agua fresca recipe and really tries to integrate the fruit juice. The video below was created to help circulate internally, the different infusion methods that were studied during this project. 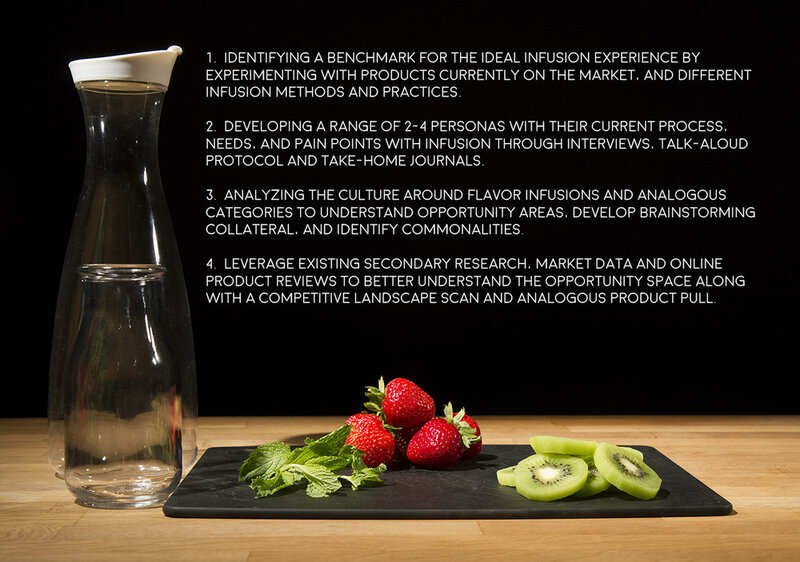 Nine participants were interviewed and asked to perform a “first-time use” study with competitive infuser products. The participants were asked to speak out their thoughts aloud as they used the products. Then tor two weeks, they were asked to take it home the and record their experience. The nine participants were then interviewed for a second time. After reviewing the audio interviews, the following quotes were organized into insights and it became apparent that the infusion market had several competing needs. To better articulate the competing information, the insights were further developed into personas. Personas concentrate on what motivates a user, what a user does, and what gives the user satisfaction. They are archetypal users of a product or system, whose goals and characteristics represent the needs of a larger group of users. They function as stand-ins for real users to guide decisions about design and functionality. The primary research quickly made it clear that only a very small number of people would be willing to infuse their water on a regular basis because of the high level of inconvenience. However, this small group typically became passionate advocates and motivated consumers. Although their individual motives varied greatly, the simple Venn diagram below seems to capture the most high-level insights. The slideshow below features the initial exploration around the potential design opportunities outlined by the research. Although the research provided broad opportunity areas for product development, the internal marketing team decided that the consumer space was too small to invest efforts in developing a whole new product. Instead, we would leverage one of the existing products in the company's portfolio and create an infusion accessory. After presenting the design research and design opportunities, the legal team found a very, very broad patent that covers any active manipulation of fruit within a water bottle. It became apparent that a number of ideas would fall under this category, so a couple of passive fruit infusion concepts were selected and then tested against the biggest competitor in the market - Zing Anything. Storyboards were created to help explain the work flow for the online consumer survey. While the marketing research was being conducted, the most promising concepts were further developed visually and finessed to work around the patent constraints. The market research came back in favor of leveraging existing lids and so appearance models were made of concept cone. There were two concerns with utilizing existing lids; what form worked best with a straw and would the assembled model be too tall? Appearance models were made to better understand the answer to these two questions. The bottle size seemed appropriate but the straw trajectory, when assembling the lid, limited the size of the cone infuser. The team decided to move forward into production with concept minimal instead. 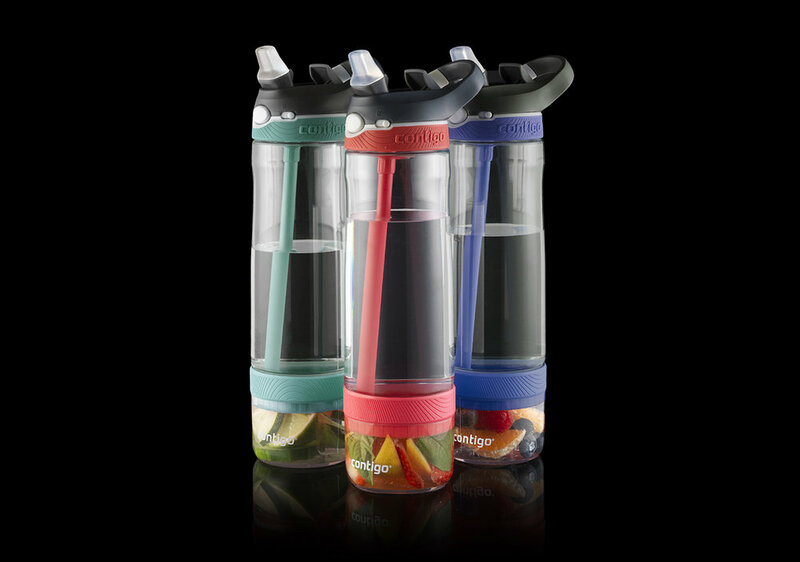 The appearance models also helped drive the decision about what visual form was most appropriate for the infuser cup. 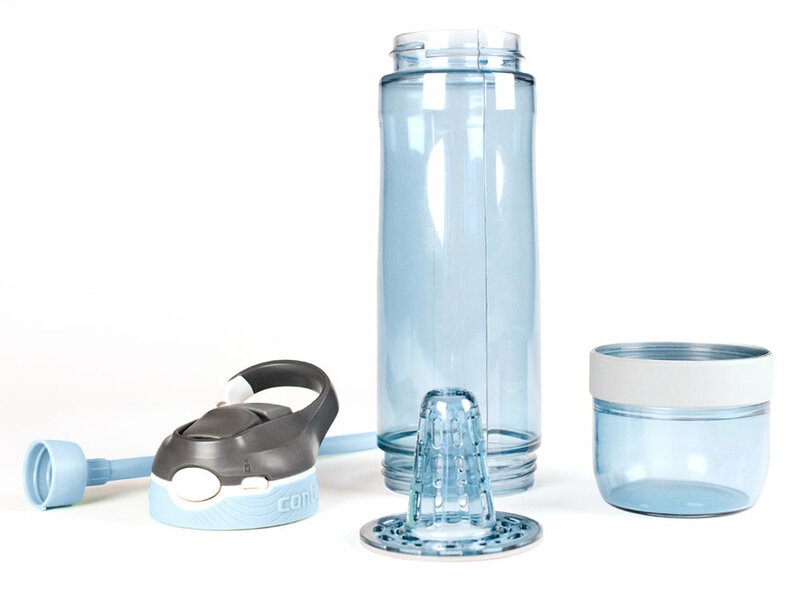 Although the large elliptical radius helped unify the infuser water bottle with the original bottle, it gave the impression of instability and limited fruit capacity. The production version featured a minimal radius and the walls were straightened to make the cup capacity look larger. After a few production prototypes, engineering also recommended adding short inner wall segments to help keep the infuser from slipping from the blow-molded body.